A gas stove, gas and a powered cooler box are included with the van. Migs, cutlery, utensils and pots/pans also come with the vans. There is a non-refundable booking deposit of £150, receipt of which confirms the dates of your booking. We take payment by electronic bank transfer. The balance for your booking is due 42 days before the hire period commences. Cancellations between the time of confirmed reservation and 42 days before the rental period, the booking deposit is forfeited. Cancellations between 42 and 7 days of start of the rental period, a fee of 50% of the balance of the payable hire charge will be incurred. Cancellations less than 7 days before the rental period commences, 100% of the total hire charges are forfeited. However, if we do manage to get another booking for the same van for the same rental period, we will waive the cancellation fee but not the non-refundable booking deposit. The depot (where the vans are) is location at Home Farm near Hartlepool, Co, just outside Durham (south of Newcastle). 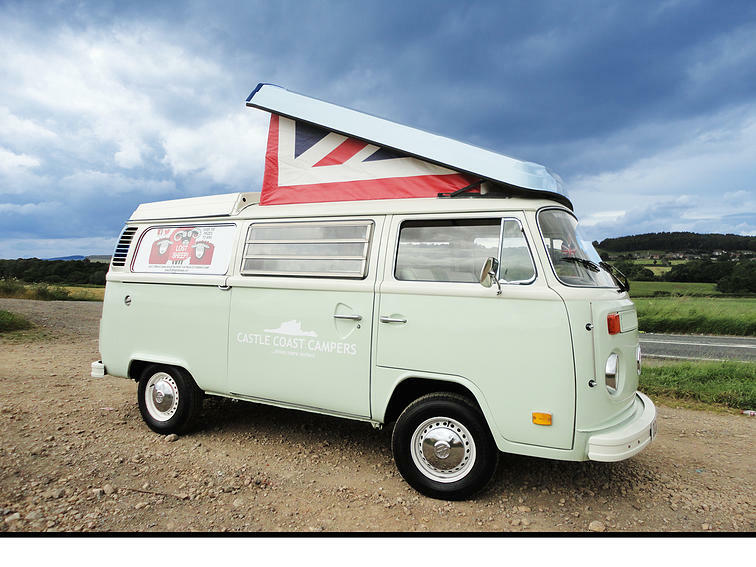 Come and experience what a break in a Campervan really has to offer. Step back in time and discover our history and heritage at award-winning attractions including museums, stately homes, historic sites and the castles that dominate our hill and cliff tops. And if you are wanting real culture, you cannot get much better than the incredible collections and contemporary exhibitions at both of the National Railway Museums, the Bowes, the Baltic, Beamish, the Hancock and the Laing Art Gallery to name but a few. County Durham, Yorkshire and Northumberland have packed year-round calendars of events to enjoy too, from Elton John to the Willowman Festival, from food fayres to vintage rallys; and Yorkshire also plays host to the world's greatest cycle race, Le Tour de France, in July.​ Our lovely County Durham, Yorkshire and Northumberland market towns offer their own unique shopping experiences, and you can take some time out in a cosy pub next to the open fire or in a sunny beer garden or see the great outdoors on a walk through the ever changing landscape, from spectacular coast to stunning dale. And just when you think you have seen it all, County Durham, Yorkshire and Northumberland will continue to delight with hidden gems around every corner. What's more is that when you choose Castle Coast Campers for your VW Campervan hire, we can pick you up and drop you off from Newcastle or Teesside airport or one of the local train stations. Alternatively, we offer free secure parking for your car in our quiet, small village location. The vans are upgraded from their original 1970s specification so that they now have modern seat belts to all seats (making them suitable for most makes of child seats), they are fully insulated with non-itch eco-insulation, have automatic engine bay fire suppression systems fitted (as used in racing cars) as well as interior smoke and carbon monoxide detectors, a fire blanket, fire extinguisher and full first aid kit on board. The Campervans have also had all their original gas pipes and regulators replaced and are inspected annually by an independent Gas Safe Registered engineer to ensure they achieve their annual Gas Safety Certificates. They are also kitted out with a DVD player, i-pod/smartphone friendly CD player and tuner and, of course, they also come fully equipped with all the camping equipment you might need! The three Campervans are "Tilly" (light green), "Scarlet" (red) and "Henry" (light blue). You can park your car at the Cast Coast offices for your trip at no extra charge. In case of a breakdown, the vans are fully covered with 24-hour RAC roadside assistance and the company staff during business hours.